Mom and dad drove out to see the new home and help tick a big pile of things off our household to-do list. Now the upstairs toilet works, the deck won't fall down, the shed has power, the closet doors close without falling off, we have four smoke alarms and a CO detector, a working fireplace, electrically safe outlets outside, fewer cords sticking out here and there, a ceiling fan in the bedroom, a handrail going downstairs, a front door that locks, and tremendous peace of mind. I thank them enormously for the loving gift of their time, expertise and company. They also brought down some gifts from Amanda's Ontario bridal shower (thank you everyone!!!!!) ... and an assortment of tools, including a fan rake. I went nuts with the rake. The former owners clearly gave up on landscaping and yard maintenance last fall, so I commenced raking up the leaves. 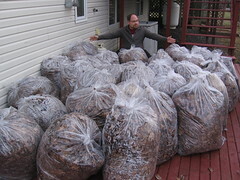 What you see before me is at least 30 (I can't count) bags full of yard debris. I could have filled more, but it started raining around the time my muscles finally gave up.